Q How do you analyse the current political situation of the North? Our people are worried today because both the United National Party (UNP) and the Sri Lanka Freedom Party (SLFP), as the two main parties, talk about a political solution within a unitary State. We, the Tamil National Alliance (TNA), received a mandate from our people to secure power devolution under a Federal Constitution. That is fully-pledged power devolution between the centre and the provinces. That means autonomy should be given to the North and the East as they are the traditional areas of habitation of Tamils and Muslims. People gave a mandate to the TNA to achieve this. Our understanding now is that the UNP and the SLFP insist on retaining the unitary character. It would pave the way for the ‘division of people’ and the country. The UNP even adopted a resolution at the recent Working Committee to this effect. Yet, a Federal system can unite the three communities - the Sinhalese, Tamils and Muslims. It is a method experienced in various countries. Q Is that the only concern of the people in your view? Actually, some people are still in welfare centres. There are also Sri Lankan refugees living in camps in Tamil Nadu in large numbers. They are unable to resettle in their original lands because of military occupation. Even the Navy and the police occupy people’s lands. Recently, President Maithripala Sirisena visited Jaffna and came to my electorate as well. He announced that 450 acres of land would be returned for resettlement. The military has fenced the lands with barbed wire and the lands were even identified by the President to be released. The military has fenced several such lands. People are unable to carry out their livelihood activities such as agriculture as a result. The other issue is Tamil prisoners. Parents are worried because their children languish in jails. They are in tears, and agitate. People are planning to agitate against the non-implementation of the promises. Regarding the fishermen, we also urge the government to release the fisheries harbour at Myliddy. Fishery activities are not allowed, but the authorities concerned have allowed private parties to anchor their vessels and unload various goods, such as sugar, cement etc, unchecked. People want the release of this harbour for fishery activities. Opposite Hindu temples, Buddhist Vihares and statues have been put up. We are not against Buddhism. We respect Buddhism. But we would like to say there are no Buddhists living in these areas. Q In your response, you said that if the unitary State was insisted on, it would pave the way for division of the country. How could that happen? I do not say they insist. They have announced in the media. Last week, the UNP resolved in their working committee that their position was to have a unitary State. We have discussed this matter with both the President and the Prime Minister. We stressed that a political solution should be under a Federal system of governance. We urged that the North and the East must be an autonomous region. We were given a mandate for it. I quoted the relevant section of our manifesto on December 10 in Parliament during the debate. I explained the stand. People are perturbed about the situation. They are concerned about what would be the nature of the political solution being evolved. Q You said the retaining of the unitary character would make way for the division of the country. How would it happen? We had a lot of experience in the country during the past period. Whatever power devolved has also been taken back by the centre in some cases. In the past, the transport was a subject devolved to some extent. But, it was withdrawn later on. In the debate on the Finance Ministry, I said it was a centralized subject. 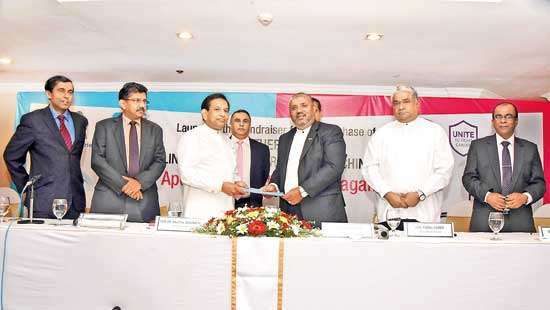 It is shown in the manner in which allocations have been made to the provincial councils. Under a unitary character, there will always be obstacles to devolution of power. The Sinhalese, in their mindset are trying to dominate us through the unitary form of governance. In their minds, Tamil people are the second class citizens. In history, even some Sinhala leaders suggested Federalism. With the experience of living under a unitary State, we know it is to dominate us. We do not want to be. Countries such as Canada, and the USA remain united under Federal systems. If they keep the present unitary character, Tamils would think that there is no justice and devolution of power for them. It would create divisions in mindsets and would lead to the division of the country. People in Jaffna make a lot of queries about it from us. They say they want a Federal system, an autonomous region and the merger of the North and the East. They say nothing is likely now. People agitate in our presence and ask questions. Q Now the subcommittees have submitted their proposals for Constitution-making. What are your views on them? There is lack of clarity in these recommendations. It is not clear what the powers meant to be devolved are and to what extent it should be done. We are waiting for the Steering Committee recommendations. Once that report is submitted, we will see. 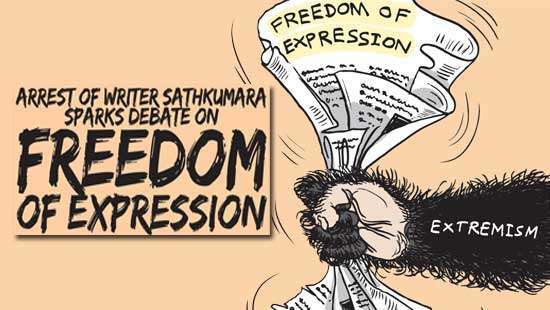 Before the report is presented, the UNP and the SLFP said they were for a unitary Constitution. Q In your view, how realistic is a political solution against this backdrop? In 1977, the people gave a mandate to the then Tamil United Liberation Front (TULF) to restore dignity. That was a mandate for Tamil Eelam. But, in 2015, we submitted a manifesto before the people demanding a Federal solution. People voted for us overwhelmingly. We urged the Sinhala leadership should accept the Tamil people’s mandate to find a political solution within a united country, a Federal Sri Lanka. We were able to discuss the matter with the President. We discussed that this was a good opportunity because the UNP and the SLFP were parts of the government. It is a good opportunity to find a political solution in line with our aspirations. We are not asking for the division of the country. The Sinhala people are opposed to division. The country could be kept united under a Federal system. Thousands of people lost their lives within both the Tamil and Sinhala communities due to the unsettlement of the problem. Q Do you believe that an acceptable political solution would be worked out this time? We are confident that the Sinhala, Tamil and Muslim leaders would come together and find a solution within a Federal structure. 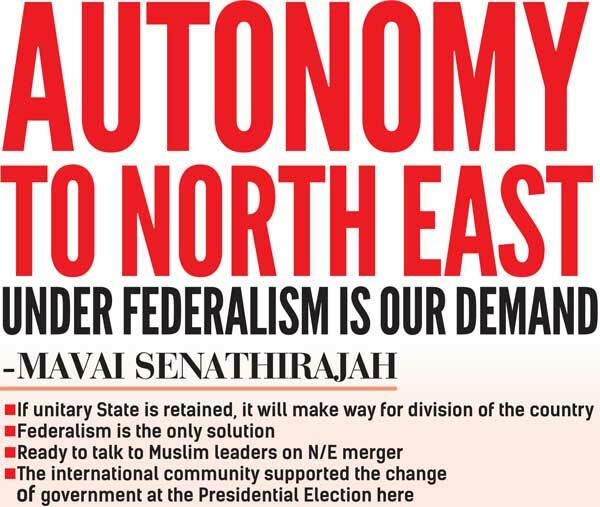 The North and the East should be merged for an autonomous region. We are confident that the leaders would come to an agreement finally. Sri Lanka also cosponsored the resolution adopted by the United Nations Human Rights Council (UNHRC). In this manner, Sri Lanka is committed to find a solution. We think the international community would support the government to work in this direction. Q Now, the global situation has changed with the election of a new President in the USA. How do you look to the international community now to find a solution? The international community supported the change of government at the Presidential Election here. Time was given for the adoption of the new UNHRC resolution. They urge the government to find a political solution in consultation with the Tamil people and the TNA for that matter. They will take up the matter and prevail upon the government to make it a reality. Q Actually, I am referring to the international situation in this regard with the election of new President Donald Trump in the USA? We are not clear about his position as of now. We do not know his position on Sri Lanka. We are prepared to discuss our concerns with international leaders, particularly with the US President elect and diplomats, and India. We also urge them to help find a Federal solution sharing powers for economic development. Even the financial power should be shared. Investments should be in our zone for building up the economy and creation of employment. Q What is your position on the demand for the N/E merger? We urge for it. In the future, we are prepared to discuss with the Muslim leaders on the matter. Some members of the Sri Lanka Muslim Congress (SLMC) say they do not accept the merger. But, they are prepared to talk to us. The TNA is also ready to talk to them. In the solution proposed during the time of the then President Chandrika Bandaranaike Kumaratunga regime, there was a proposal to link Batticaloa and Trincomalee with the North. Now, I do not talk about it. However, devolution should be done to the unit of merged North and East. We are prepared to talk with the Muslim leaders, and accommodate their political views. Muslim people also understand that they want devolution of power. We expected the government to devolve financial power. We demand the government to allocate sufficient funds for the development of war-torn areas. Q Resettlement and Rehabilitation Minister D.M. 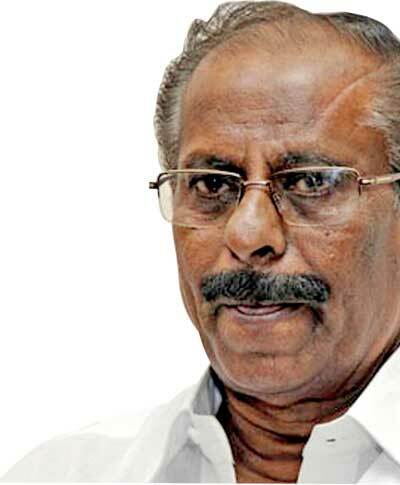 Swaminathan accused the TNA of scuttling development work. He was referring to the housing project he proposed. How do you respond? We are opposed to the project to construct prefabricated abode. These steel structures are not suitable in the Tamil areas. The TNA is opposed to it. Even Ms. Kumaratunga is against to it. The Minister should cooperate with the TNA and the Tamil community to resolve the economic issues. A programme involving all is now contemplated for developing the North. 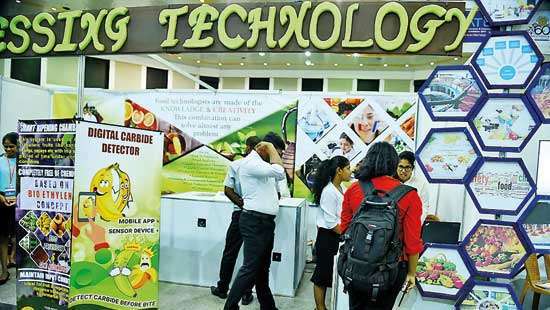 Minister Swaminathan tries to implement things on his own. Therefore, we oppose it.